Slant Eye For The Round Eye: OU aKDPhi's 5th Annual invASIAN: "Growth through Creativity." 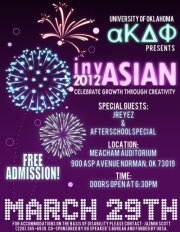 OU aKDPhi's 5th Annual invASIAN: "Growth through Creativity." alpha Kappa Delta Phi Sorority at the University of Oklahoma will be hosting our 5th annual invASIAN showcase on Thursday, March 29th in Meacham Auditorium at 7:00PM. Our MCs will be Bilal Ittiq and Yen Tran! invASIAN is a showcase that displays the talents that Asian-Americans have developed through their opportunities in the United States. Our objective is to assist local artists in their endeavors to become more recognized in their perspective fields and to increase Asian awareness by showcasing talented Asian-Americans to the OU community. In the past, artists from several different aesthetics, from DANCE and MUSIC, to FASHION and PHOTOGRAPHY performed in aKDPhi's annual invASIAN showcase. Each year, we also invite a nationally recognized Asian-American individual, who we feel, through their dedication, has promoted Asian-American Awareness through their hard-earned success. In the past we've had the honor of showcasing WONG FU PRODUCTIONS, DAT PHAN, MIKE SONG, & JASON YANG.